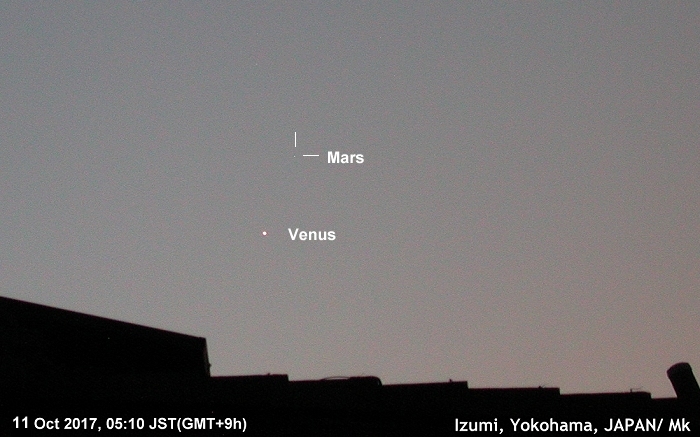 The following photograph of the eastern horizon [taken by Masami MURAKAMI (Mk) at Yokohama] shows Mars as a duller star of +1.8 magnitude just above the bright planet Venus (whose visual magnitude is -3.5) on 11 October 2007 at dawn at 05:10 JST (GMT+9h). We thus should say the season of Mars observation has already set in. The apparent disk diameter δ was 3.7 second of arc on 10 October 2007. 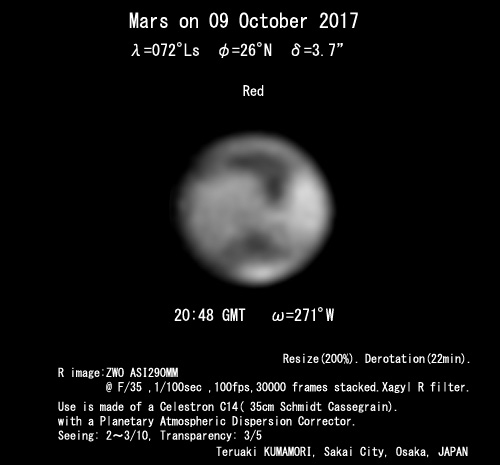 The day before, Teruaki KUMAMORI (Km) from Sakai, OSAKA succeeded in producing the first excellent Mars image in this apparition under a severe condition of δ=3.7" and a lower altitude. The most famous dark marking called Syrtis Major is nicely shown up. The δ will be no larger than δ=4.8" even at the end of this year. It will however gradually increase its size finally to δ=24.31" when it is closest to the Earth on 31 July 2018. The minor marking which we called "Oxus Dark Segment" in CMO #423 (25 June 2014) at pages Ser3-0725 & 0726 was detected several times by Damian PEACH (DPc) and others when the angular diameter was around δ=14" in 2014. 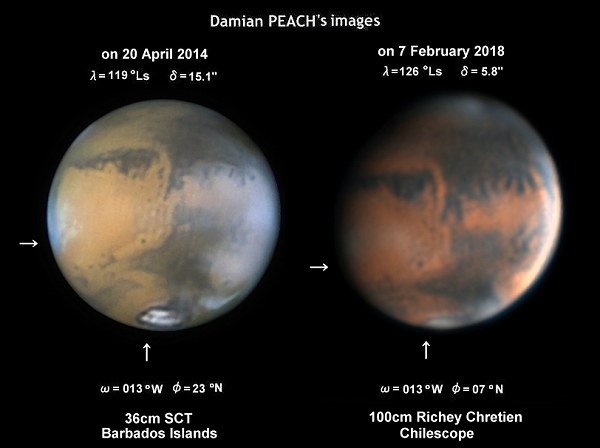 However this season the Oxus Dark Segment was already pinned down amazingly by DPc and his collaborators at Chile just when δ=5.8" by the use of the remote controlled Chilescope (100cm Richey Chretien). On 31 May 2018, Efrain MORALES (EMr) and John BOUDREAU detected a bright dust band from the LCM angle ω=338°W and ω=358°W respectively at the eastern end of Mare Acidalium from the area around (030°W, 30°N) to (005°W, 45°N). This was also barely checked on the preceding day (30 May at λ=184°Ls) by EMr at ω=346°W. 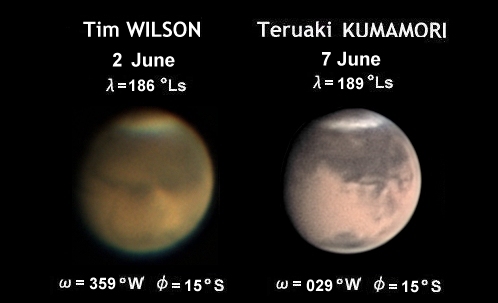 Note that the season was nearly identical with the case when the 2001 global dust storm started at λ=184°Ls. Cb. Resonances at the beginning of June and aftermath. On 2 June Tim WILSON (TWl) detected a resonance at the area of Thymiamata and Aram. On 7 June, Teruaki KUMAMORI (Km) proved that the large region preceding Aurorae Sinus is turned out well swept by the dust clouds. 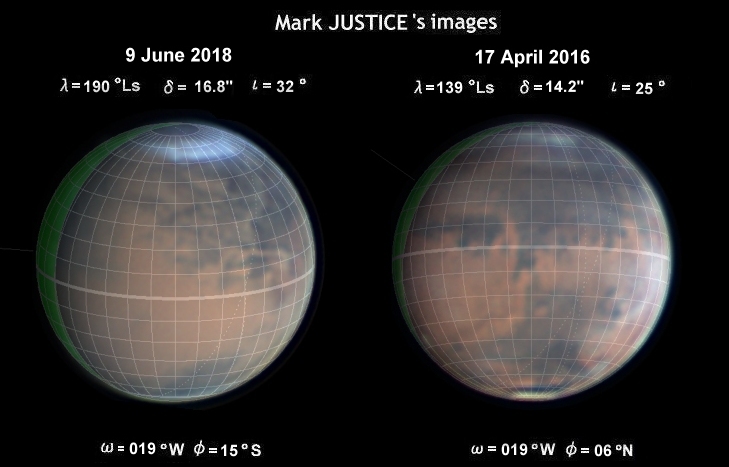 We here show how wider region went missing because of the dust covering by employing Mark JUSTICE (MJs)'s excellent images on 9 June 2018 compared with an image made on 17 April 2016 on the grids (note that both images were produced at the same LCM ω=019°W). D. Notable dust disturbance seen at the following area of Sinus Meridiani down to the northern end of Margaritifer Sinus (including Oxia P). On 7 September 2018, Damian PEACH (DPc) produced a very interesting image at ω=053°W where the 2018 global dust expansion is still prevailing while some of familiar smaller markings are nicely explicit (by the use of the so-called Chilescope). 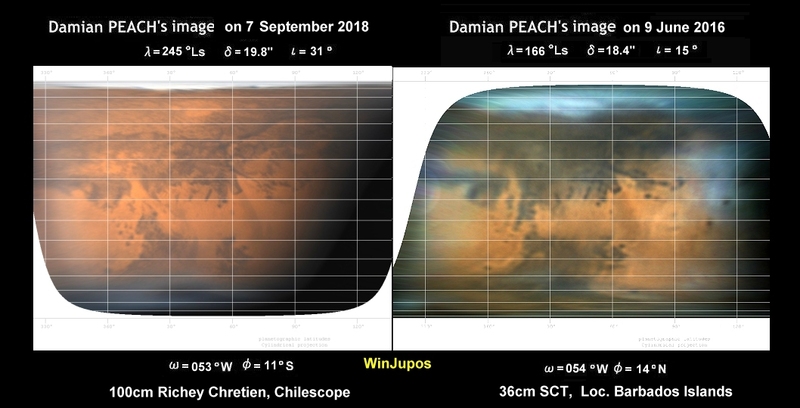 Here we provide two sets of the WinJupos development-views where the second image is from DPc's image made in the preceding apparition on 9 June 2016 at ω=054°W where the atmospheric status was normal. One of the extraordinary differences will be found around the area of the upper Aram down to an area of Niliacus Lacus, wiping out the northern end of Margaritifer Sinus including Oxia Palus. 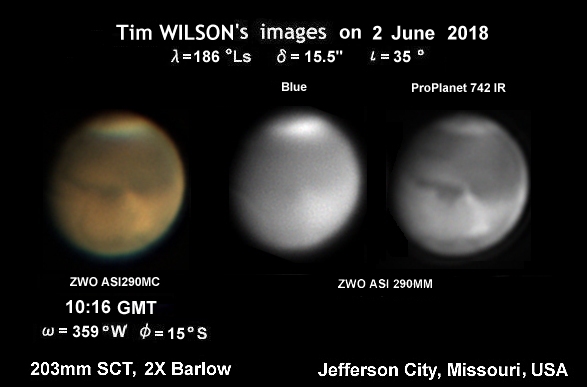 There are few appropriate images at around the area, while the set of images made by Tim WILSON (TWl) on 2 June 2018 (where λ=186°Ls) may give an earlier hint.